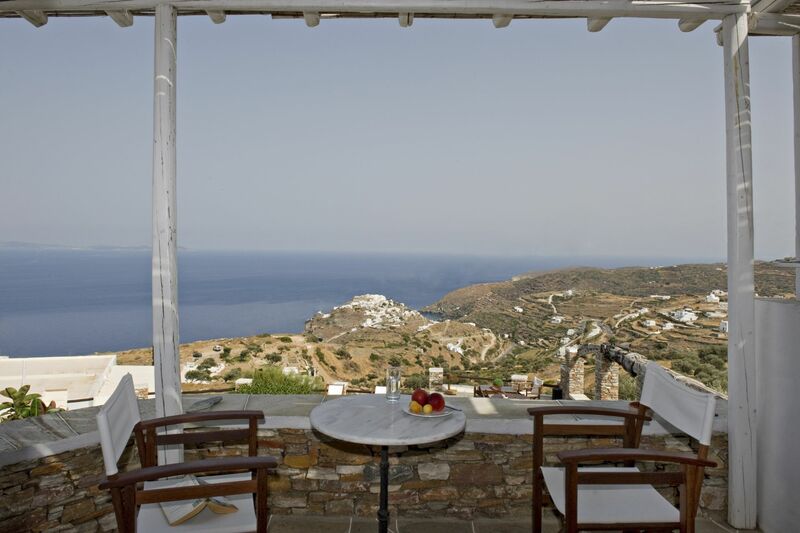 Windmill Bella Vista is located on a hill on the edge of the village of Artemonas, offering a truly magnificent view of the captivating Aegean Sea, the neighbouring Cyclades islands, the surrounding countryside of Sifnos and the local villages including the historic village of Kastro, the ancient capital of Sifnos. 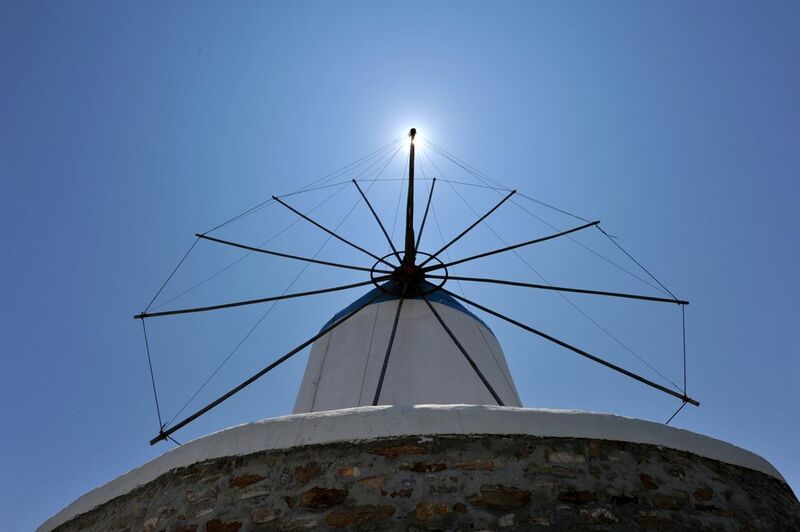 Our picturesque windmill plus our carefully designed, whitewashed studios and apartments, constructed in true Sifnos style with traditional architectural stonework, are just some of the aesthetic pleasures of Windmill Bella Vista. 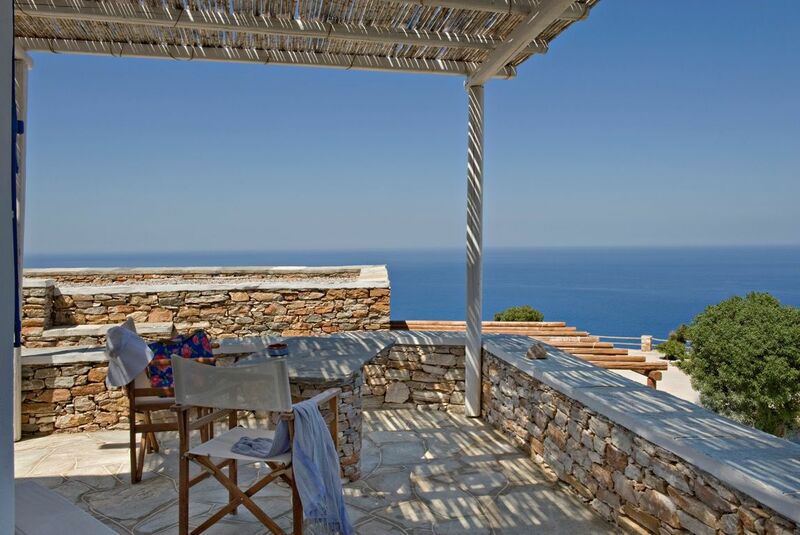 Combine these with a breathtaking view, superior levels of service plus contemporary standards of comfort and you have all the elements needed to enjoy a private, romantic and relaxed holiday experience on the Greek island of Sifnos. 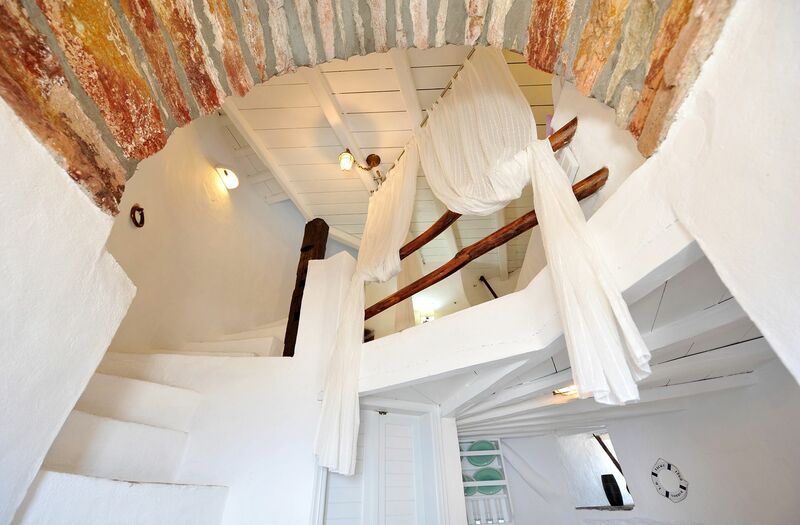 The Accommodation to rent at Windmill Bella Vista is made up of: Studios, Apartments and of course our beautiful and Traditional Windmill. Accommodating up to 3 persons, our studios are of an open plan design with a double and single built bed, private bathroom and kitchenette. 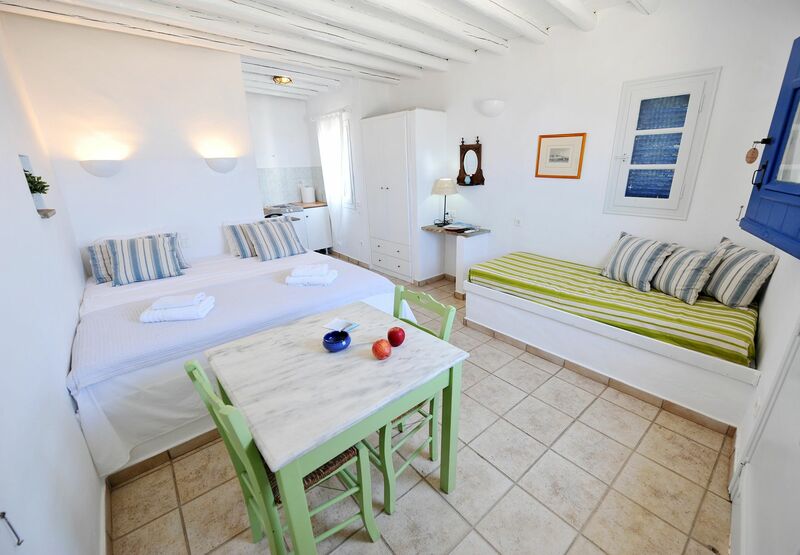 Our apartments will accommodate up to 4 persons. 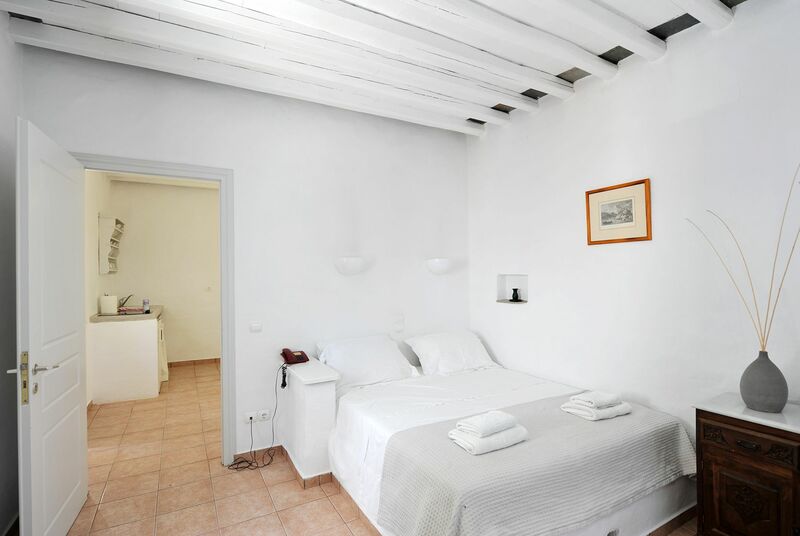 They have a separate bedroom with a built double bed; a living room with 2 built single beds, a kitchenette and private bathroom. 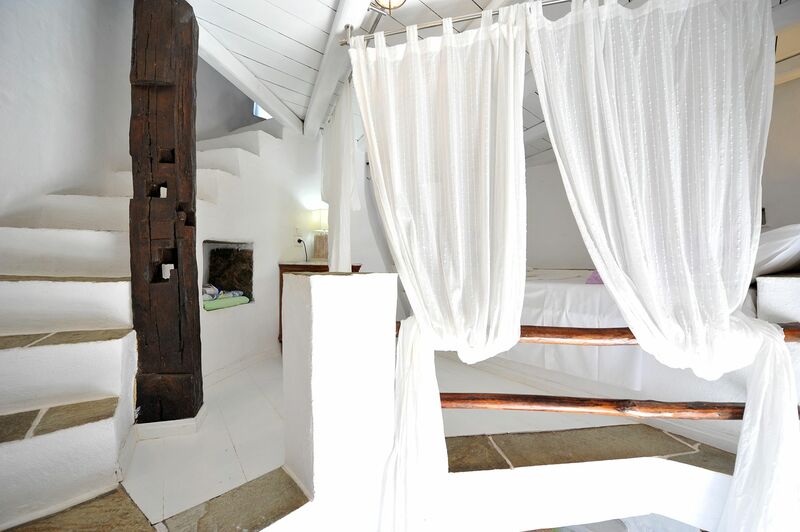 Also accommodating up to 4 persons, the superior apartment at Windmill Bella Vista is similar to the standard apartment but for added privacy there are 2 separate bedrooms. 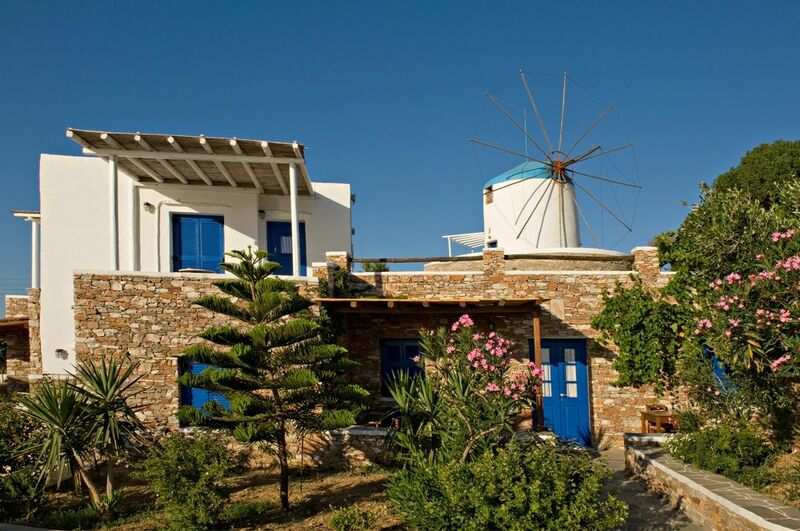 Our traditional windmill is capable of accommodating 4 persons and has been completely restored using only traditional materials. On three levels, the windmill has two bedrooms with double beds and on the ground level is the fully equipped kitchen area and bathroom. 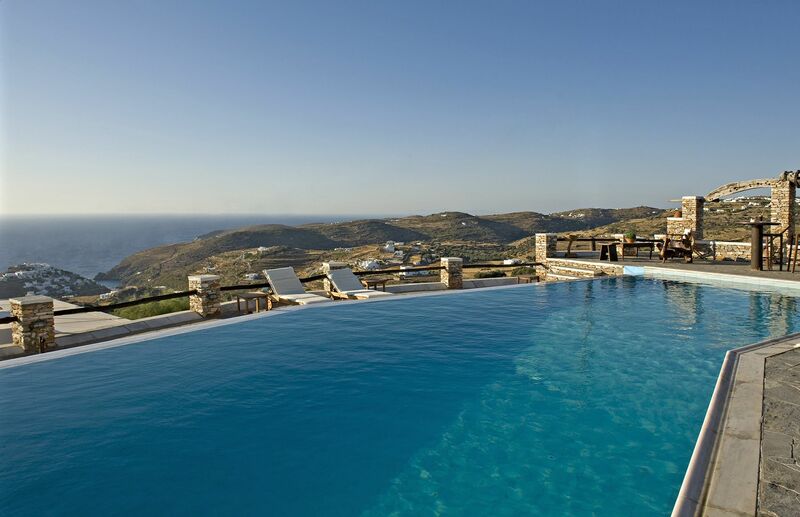 Being in an elevated position at the centre of the Bella Vista complex, guests will enjoy the panoramic sea and countryside views from the veranda that surrounds the windmill. All units at Windmill Bella Vista have individually controlled air conditioning and heating. 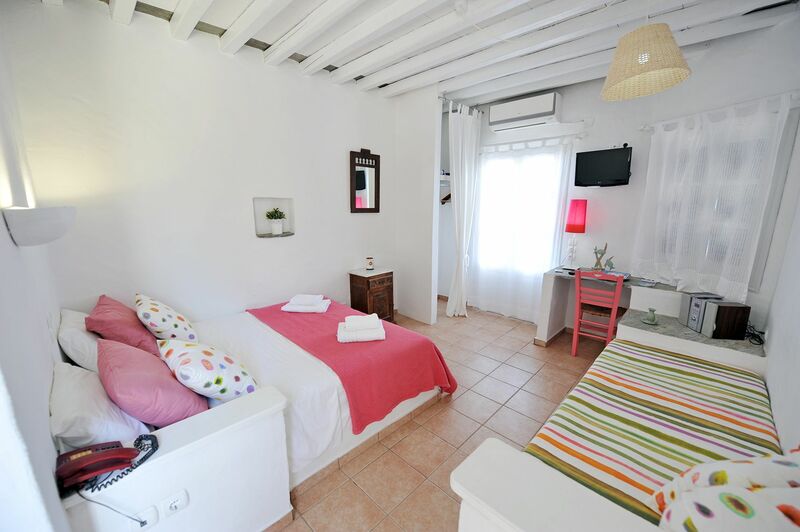 For the added comfort of guests, additional features of all units include a colour TV, CD player, mini bar, direct dial telephone, hair dryer and a private balcony or veranda with sea view. 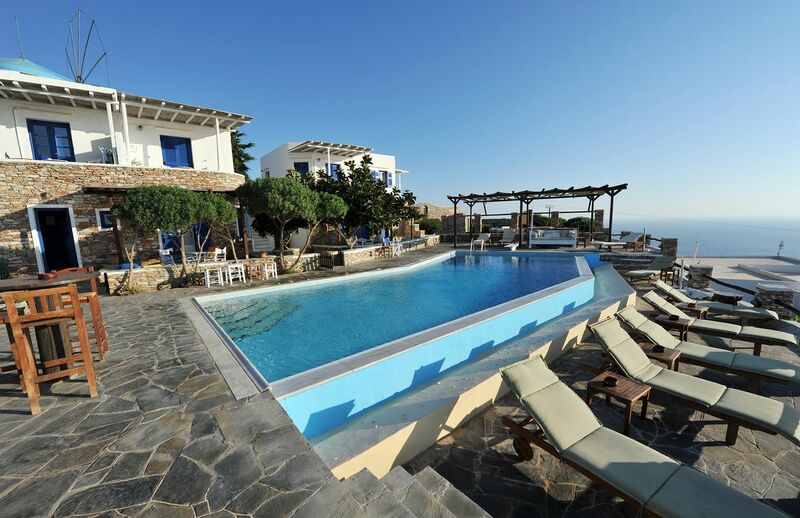 Facilities at Windmill Bella Vista For the comfort and pleasure of guests, facilities at Windmill Bella vista include a traditional café bar with outdoor terrace and breathtaking sea and countryside views. Serving snacks and drinks throughout the day and is also suitablefor your private wedding reception or baptism celebration. 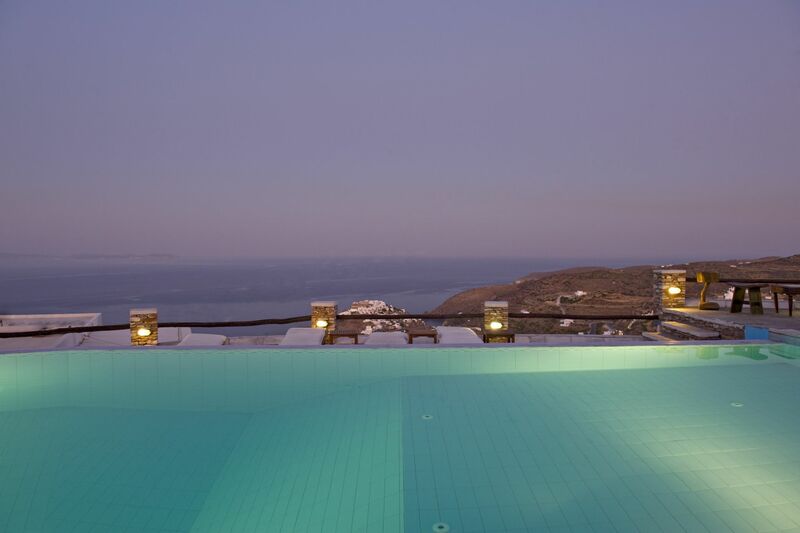 Our swimming pool with hydro massage is a real joy during the hazy days of summer. 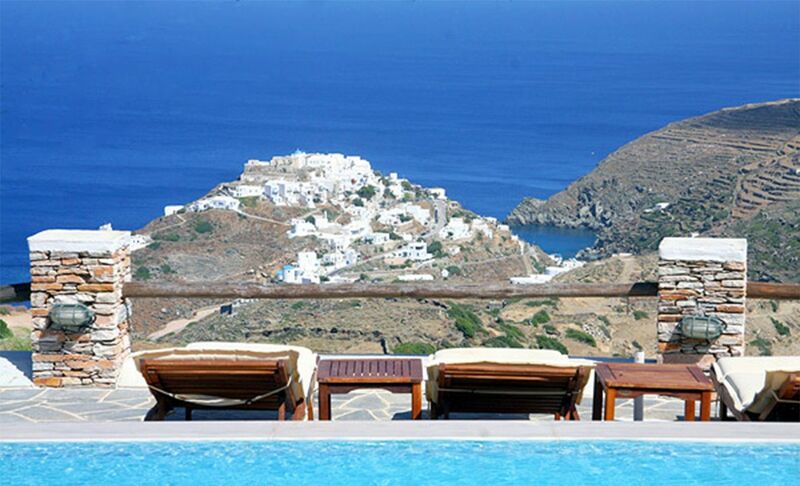 You can enjoy a refreshing swim or just laze around with pool with a long cold drink from the pool bar. 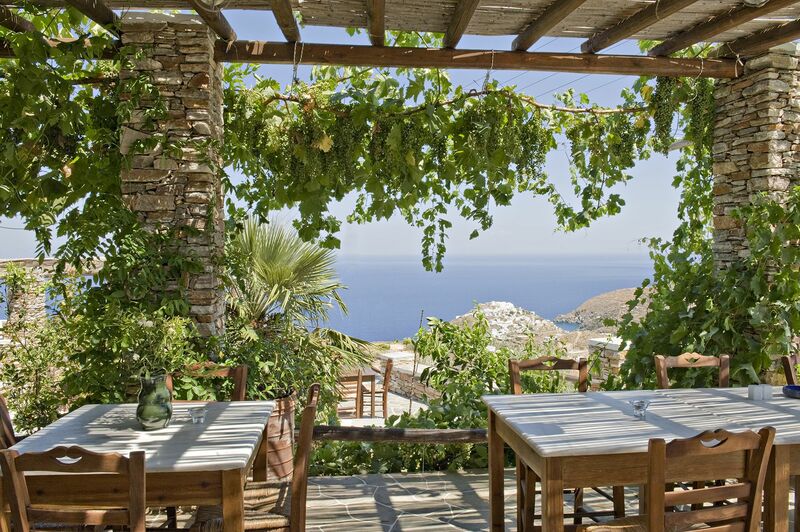 Greek lessons for guests of Windmill Bella vista and can last anything from 1 to 3 weeks. The lessons are very casual and usually take place in the snack bar or someplace more private if required. Photocopies of notes are provided as a reminder of what you�ve learned. 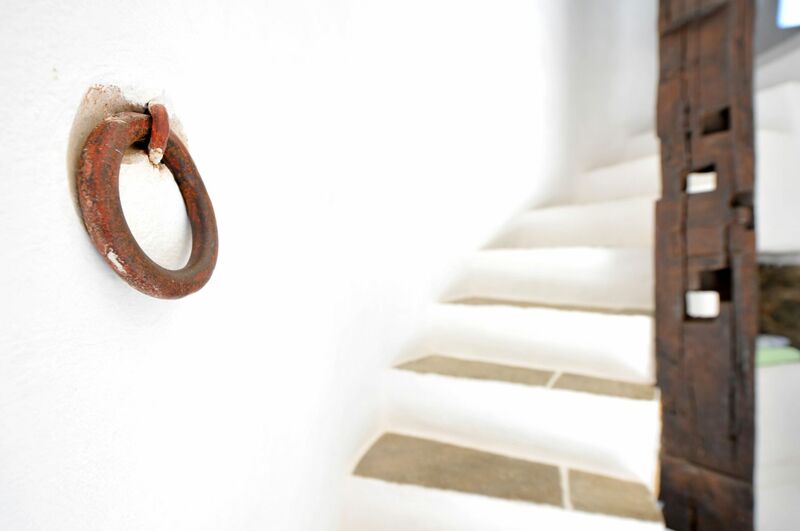 Manama is the name of our fine Arabian horse; guests with some riding experience have the opportunity of taking a ride along the traditional footpaths of Sifnos and enjoying the beautiful landscape of Sifnos from a different prospective. Other general facilities and services at Windmill Bella vista include: laundry facilities and daily maid service, internet/fax service and guest parking area.